CR DON Hill has been elevated to the position of South Gippsland Shire Council Mayor after a vote last Wednesday (November 21) in Leongatha. He replaces Cr Lorraine Brunt in the role. Cr Alyson Skinner was elected as Deputy Mayor, the only person nominated to the role. She replaces Cr Aaron Brown, who was vying for the position of Mayor, along with Cr Ray Argento. Cr Argento was defeated in the first round of voting, creating a contest between Cr Brown – who secured the second-round votes of Cr’s Brunt, Jim Fawcett, Skinner and Brown – and Cr Hill, who secured the votes of Cr’s Andrew McEwen, Jeremy Rich, Argento, Rosemary Cousins and Hill. In a statement to Council ahead of the vote, Cr Hill told fellow councillors that they had an “excellent plan” that had not been “implemented as quickly or efficiently as I would like”. “This Council has become distracted with debate, rather than getting down to implementing the program,” he said. “As a school teacher with 30 years experience in student management, and several years with a mathematics department of 16 staff, I understand the ways and manner of getting disparate views and personalities. Cr Hill said the Mayor needs “a firm hand and the desire to be fair and impartial”. “I aim to be inclusive and available to all councillors. I see the role as an enabler of good process by an implementation of correct practice,” he said. “If elected to the position, my first task would be to have the Council group determine a set of agreed behaviours and processes that they wish to have in their meetings, which I would ensure were followed. Cr Hill said he had been working hard “to build constructive relationships with other councillors” and would continue “to build better relationships with the CEO and directors”. “I have several ideas I’d like to see implemented to improve the working relationships between councillors and the executive team,” he said. He believes changes need to be made at Council, with the Mayor “being involved with high level discussions such as Budget preparation and other Council planning initiatives, ahead of officers bringing a proposal to Council”. “I believe I have the ability to think outside the square and think on my feet. These skills are needed in an environment where complex issues, and often short time frames, come together to hinder good outcomes from those who tend to procrastinate,” he said. On acceptance of the role, an emotional Cr Hill admitted being lost for words. But he had regained his composure (and his words), when interviewed later by Nine News Gippsland TV reporter Izabella Staskowski. 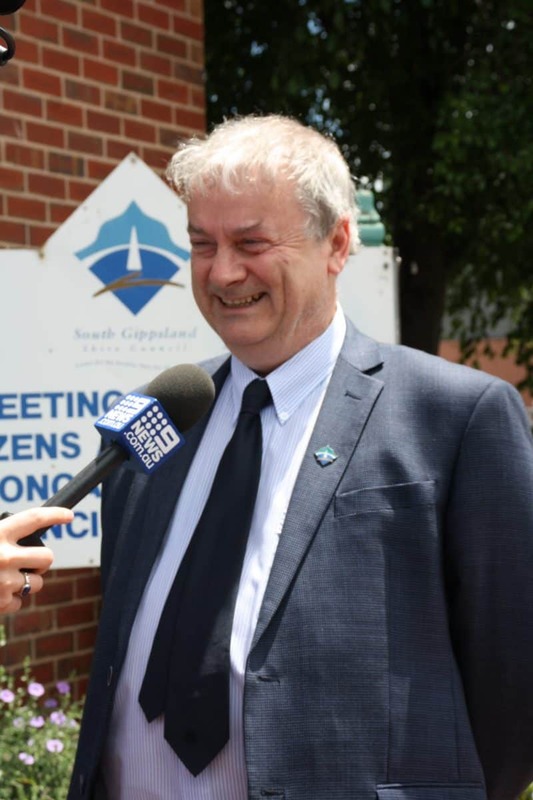 In a media-issued statement, Council CEO Tim Tamlin said he looked forward to working with Cr Hill and Cr Skinner in their new roles and their fellow councillors during the next 12 months “in delivering great outcomes for South Gippsland”. “I would like to also thank our outgoing Mayor and Deputy Mayor Councillor Lorraine Brunt and Councillor Aaron Brown for their commitment during their term,” he said.